Recent changes in federal and state laws governing non-profit charitable organizations are transforming the rules under which they operate and the methods by which they and their fiduciaries are held accountable to government and the public. 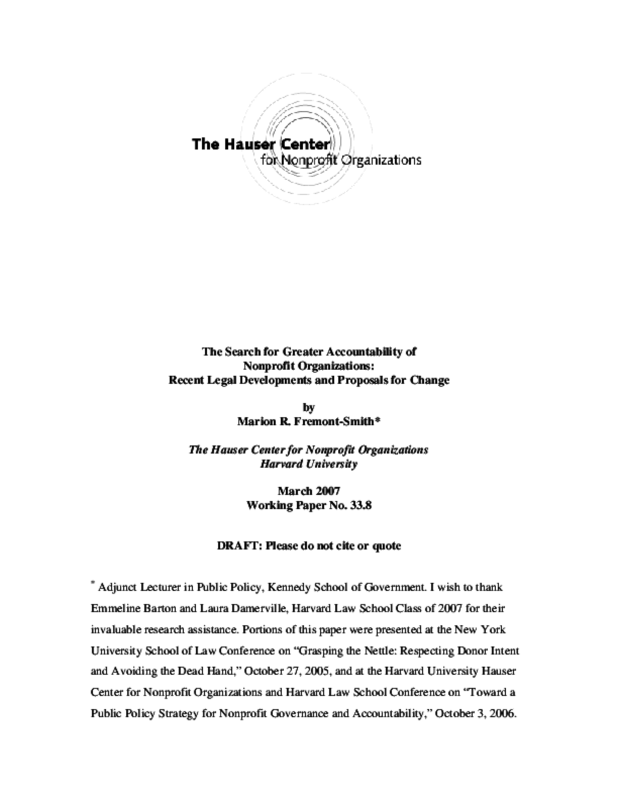 These changes include relaxing the rules prohibiting donors from bringing legal suits to enforce the terms of their gift or agreeing to modify restrictions; liberalizing the doctrines of cy pres and deviation under which charitable purposes and methods for administering them may be revised due to changed circumstances; imposing new duties on directors of charitable corporations and redefining the scope of their duties of loyalty and care. The Pension Reform Act of 2006 changed some of the IRC provisions dealing with charities and others are being considered in the Congress. Recommendations to increase federal and state regulation are also being considered together with proposals for expanding the breadth of self-regulation. The paper describes these changes and their proponents. It concludes with observations on their efficacy and the likelihood of their being adopted. This publication is Hauser Center Working Paper No. 33.8. Hauser Working Paper Series Nos. 33.1-33.9 were prepared as background papers for the Nonprofit Governance and Accountability Symposium October 3-4, 2006.